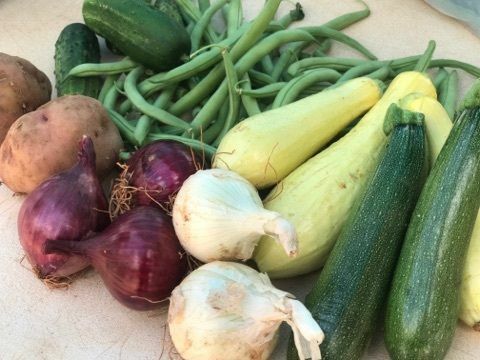 The Clemson Farmers Market has scheduled a variety of activities during First Thursday at the Market on August 2, from 3 pm – 6 pm, on the Village Green at Patrick Square in Clemson. The Market features fresh, locally grown fruits & veggies, grass-fed beef, heritage pork, & fresh seafood, home-baked goods including pound cakes, layer cakes, cookies, & cinnamon rolls, local honey, farm-fresh eggs, plants & flowers, jams & jellies, goat’s milk products including dips, fudge, & soaps, granola, olive oil, kombucha, artisan dips & sauces, boiled peanuts, canned goods, veggie baskets & recipes, dog treats & products, premium feeder insects, and artisan crafts. . . something for everyone! Vendors will be offering product information, samples and demonstrating their crafting skills. Cooking demos and tastings by Oconee Cultivation Project. Music at the Market featuring local musicians Amongst The Trees. Bring a chair and stay a while! Check out a Boat from the Freedom Boat Club. Stop by the Monaghan Co. Real Estate Community Tent to discover what makes Clemson a great place to live, work, shop, and play! Spotlight for August is on the Elevation Dance Company from Pendleton. Dance performances by Elevation Dance Company at 4:15 – 4:30 pm & 4:45 – 5 pm on the Patio. Sweet Tea Cycles will be offering free bicycle safety checks and test rides. Stop by the Edible Upcountry booth for a free copy of the magazine which features information about unique businesses, special events and activities, restaurants, & shopping in the Upstate. Check out the Family History booth to learn about familysearch.org, a FREE genealogical research website. City of Clemson, Patrick Square, and the Clemson Area Chamber of Commerce. AgSouth Farm Credit, Baptist Easley Hospital, Clemson Area Transit (CAT), Clemson Downs, Edward Jones, Freedom Boat Club, Monaghan Co. Real Estate, Osher Lifelong Learning Institute (OLLI), and Southern Traditions Window Fashions. For the Market’s schedule, directions and vendor information visit www.clemsonfarmersmarket.org. or follow the Market on facebook.com/clemsonfarmersmarket. For general information or sponsorship opportunities contact Kathi Dimmock, Market Manager, at kathi.dimmock@att.net or 864-654-3918. Eat Healthy | Buy Local | Have FUN!